Hampton & Richmond Borough reached their second Middlesex Senior Cup final in three seasons after coming from behind three times to beat Hendon by the odd goal in seven. Hampton management duo Paul Barry and Darren Powell named a very strong lineup, with only the front two not normally first choice. Ex-Hendon man Belal Aite-Ouakrim and Aaron Wickham were partnered upfront. Belal had scored four against Northwood in the previous round, while Wickham has suffered with injury recently. Hendon started brightly, and took the lead ten minutes in. A simple through ball split the Hampton defence and Jack Bennett smashed the ball past Rodney Chiweshe. However, straight from the kickoff Hampton equalised. A lovely ball from Tom Hickey over the Hendon defence found Joe Turner in space on the left. He skinned Max McCann before pulling the ball back perfectly for Aaron Wickham to slot home with the outside of his right foot. Hendon had a great chance to restore their lead when Hickey gave the ball away to Bennett in midfield. Bennett set Jonathan Hippolyte clear, but Chiweshe stood tall and saved the striker’s shot. However, Hendon did go in front once more after 29 minutes. Bennett skipped past the challenge of Tommy Brewer on the left, before standing up a brilliant cross to the far post where an unmarked Dave Diedhiou nodded in. But, as with the first lead, this one only lasted a minute. Luke Wanadio, Joe Turner and Tommy Brewer combined down the right wing, and Brewer received the final ball from Wanadio, before managing to squeeze the ball past Laurencin at the near post to level things once more. Hendon made two changes at the break, with Jose Figura and Anthony Thomas replacing Kevin Maclaren and Jack Bennett. Hampton started the half brightly, with Justyn Roberts connecting with a Hickey corner, but his volley was tipped over by Laurencin. From the corner, Aaron Wickham’s volley bounced into the ground and just over. At the other end, Anthony Thomas brought a fine save from Chiweshe. Most of the Hampton chances were falling to Wickham, and his powerful header from a Wanadio cross went inches wide. Just before the hour mark, though, and Hampton had their third equaliser. A superb through ball from Wanadio found Belal Aite-Ouakrim in the penalty area, and the ex-Hendon striker returned to haunt his old club with an emphatic first time finish. With ten minutes to go, Hampton were awarded a penalty when Aite-Ouakrim latched onto a through ball and was brought down by Laurencin. The goalkeeper was sent off, rather harshly perhaps as there were covering defenders. There was a delay of a few minutes while the replacement got himself ready to come on. 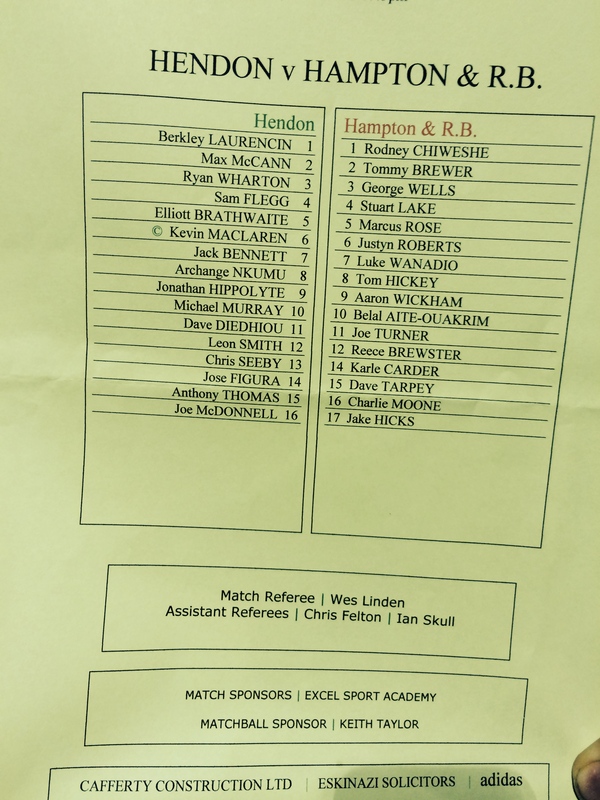 Hendon – rather unusually for nonleague football – had a goalkeeper on the bench in the form of Joe McDonnell. Midfielder Archange Nkumu was the man sacrificed. Aaron Wickham stepped up to fire the penalty home and put the visitors ahead for the first time in the match. And that’s how it finished. A superb match ended 3-4, and Hampton will now face Wealdstone in a repeat of the 2012 final, which Hampton won 2-0. The final will take place at Wealdstone’s current home ground The Vale in Ruislip on Easter Monday, April 21st with a 7:45pm kickoff. Posted on March 7, 2014, in UTL Archive and tagged Aaron Wickham, Belal Aite-Ouakrim, Hampton & Richmond Borough, Hendon FC, Luke Wanadio, Middlesex Senior Cup. Bookmark the permalink. Leave a comment.